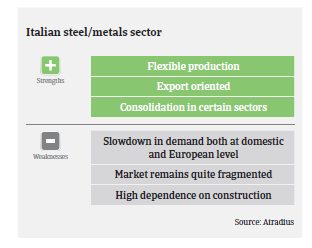 After several years of subdued performance, the Italian steel industry has rebounded since 2016, mainly due to increased demand from the automotive sector and EU anti-dumping import duties on Chinese steel. According to the World Steel Organisation, Italian steel production increased 2.9% in 2017, and 3.4% in the period January-August 2018. The rebound of steel prices has had a positive impact on the cash flow of producers. However, the performance of distributors and service centres has been impacted by higher prices for steel and metals, due to larger working capital requirements, with a negative effect on their cash flows. Steel prices have started to decrease again since September 2018, mainly due to increased imports from outside the EU. While the impact of US import tariffs on the Italian steel and metals industry is considered to be low (just 3% of Italian steel exports are shipped to the US), further decline of steel prices as a result of additional steel inflow in the EU could result in the amortisation of current inventory and decreasing margins for businesses. 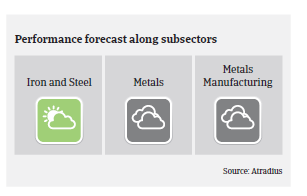 While EU safeguard measures help to mitigate the pressure on steel and metals prices driven by imports, other factors are having an adverse effect on sector performance. Demand from automotive is expected to decrease in the coming months, while demand from construction remains sluggish. The expected increase in production of the major Ilva steel plant after the takeover from ArcelorMittal (it is estimated that the plant will add three million tons of steel to the domestic market supply) could put further pressure on prices. Due to all those factors we expect more pressure on Italian steel and metal businesses margins and cash flows in 2019 compared to 2017 and 2018. 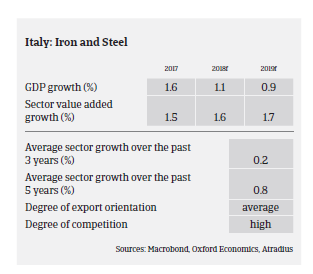 As steel and metals are highly cyclical sectors closely linked to GDP growth, any economic policy shift of the new government that would dampen Italy´s economic expansion or business investment would subsequently affect the performance. After the good performance seen in 2016 and 2017 payment delays and insolvencies have started to increase slightly in H2 of 2018. We expect this trend to continue in 2019. Businesses operating in the domestic market remain affected by slow payment from their customers, as the average payment duration is 115 days. 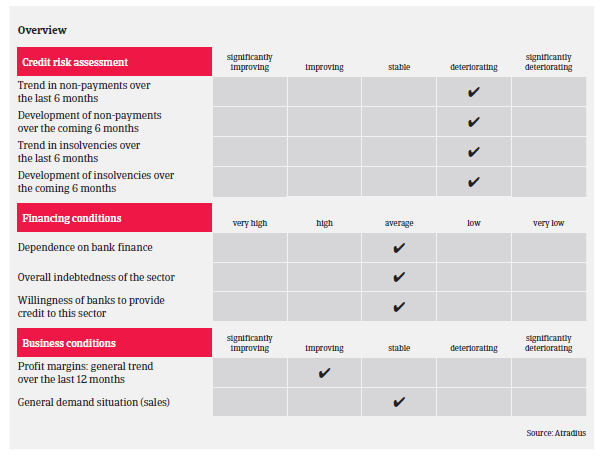 Our underwriting stance is generally open to neutral, depending on the performance of the subsectors and their main buyer industries. We are more open to steel manufacturers and to export-oriented companies, while more attention is advised for businesses dependent on domestic construction and the oil and gas sector. We also monitor players linked to automotive sector more closely due to the expected decrease in demand from this key buyer industry in 2019. We remain more cautious with the steel and metals distributors and service centre segment, which is characterised by a large number of relatively small companies that do not add a lot value, have thin margins, and are highly leveraged.